Tanah Lot Tour or known as Tanah Lot Sunset Tour is one of the Bali half day tour packages to go to the temple in the sea that is popular with the magical sunset background. Tanah Lot temple excursion spends up to 5 hours to explore the places of interest in the southwest of Bali island and the trip will end up in Tanah Lot Temple to experience the lovely panorama of the sea temple that stands on a hard rock with a fabulous view of the sunset backdrop. Tanah Lot Bali is one among the greatest destinations on the island of Bali Indonesia and it is a must-place to visit when you are on holiday in Bali. 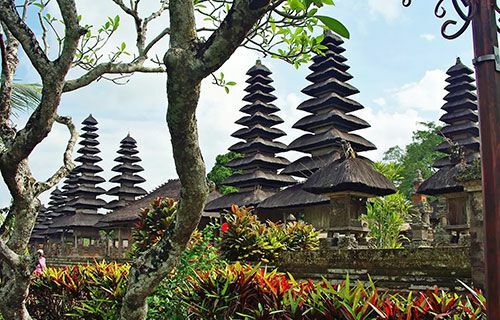 Tanah Lot Temple Bali Tour is a hit choice among most of the Bali tour packages, which really can be proved by a massive tourists are coming to visit the temple every day. 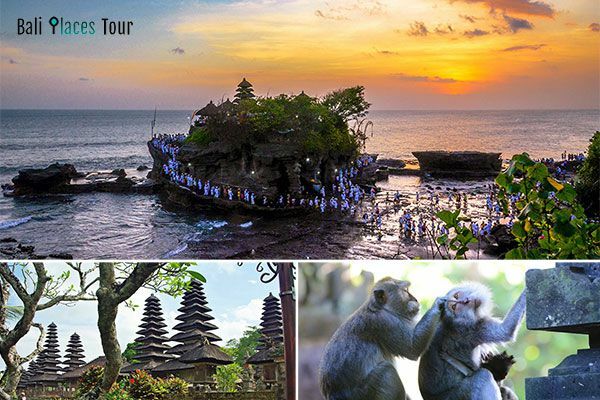 Below is the itinerary of Bali temple Tanah Lot sunset tour package in a half day around 5 hours to 6 hours, please be informed that the Tanah Lot tour package from us is a private tour with a private vehicle (NOT a sharing tour) and you will be accompanied by a friendly and professional driver. The first place to visit in the itinerary Tanah Lot Tour Package is Taman Ayun Temple that is located in the region of Mengwi, Badung regency, Bali. Pura Taman Ayun Temple is a Mother temple to the Mengwi Kingdom. This temple was built by King Mengwi, I Gusti Agung Putu, in 1556 Saka (1634 AD). Taman Ayun Temple surrounded by the large water ponds and also has a beautiful garden around it. It's one of the sites in Bali defined by UNESCO as world cultural heritage in 2012. Taman Ayun Temple is the supreme water temple with its most typical architecture, exemplifies the complete development of the Subak irrigation method under royal authorities of Bali in the 19th century. The entrance fee to visit Taman Ayun temple is IDR 20,000/person (Valid for 2018, the entrance ticket may change without any prior notice). 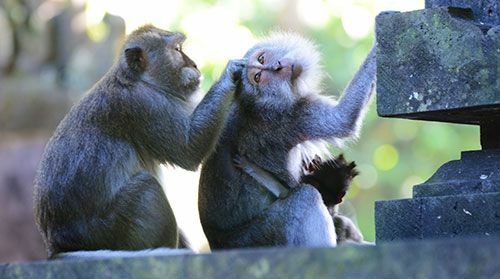 The second attraction to visit in the Tanah Lot Temple tour is Alas Kedaton Monkey Forest, it is located in the village of Kukuh, Marga Sub-district, Tabanan Regency, Bali. Alas Kedaton Monkey Forest is one the most popular sacred monkey forests in Bali island. The forest covers 6.4 hectares inhabited by monkeys and also big bats. Apart from that, there is also a temple which is located in the middle of the Kedaton forest. The Alas Kedaton temple was built by Mpu Kuturan during the reign of King Sri Masula Masuli in Bali around 1178 AD - 1255 AD. The entrance fee to visit Alas Kedaton Monkey Forest is IDR 15,000/person (Valid for 2018, the entrance ticket may change without any prior notice). 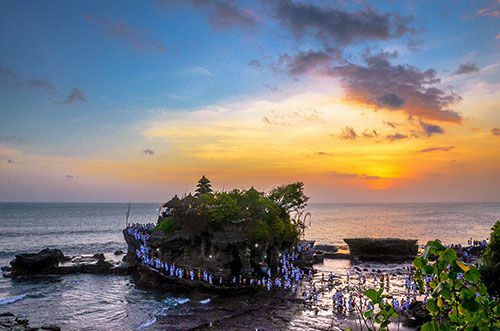 The final destination to go in the Tanah Lot Sunset tour package is to visit Tanah Lot Temple, it is located at Beraban village, Kediri subdistrict, Tabanan regency, on the south coast of the island of Bali Indonesia, more or less 25 km from Denpasar city. Tanah Lot is a Hindu temple built to worship the God in its manifestation as the God of the sea (Lord Varuna) to invoke prosperity and the balance of sea and earth. Tanah Lot Temple was built by Danghyang Nirartha (Holy priest from Java island) in 16th Century, people also call him DangHyang Dwijendra or Pedanda Sakti Wawu Rauh. Tanah Lot is a very famous tourist destination in the world and it’s one of the best attractions in Bali island, the sunset time at Tanah Lot becomes the sweetest moment that can be enjoyed when visiting this temple. The entrance fee to visit Tanah Lot is IDR 60,000/person (Valid for 2018, the entrance ticket may change without any prior notice). The tour will end here, and we'll go back to the hotel after sunset.